"Tangent Theta Incorporated is based in Halifax, Nova Scotia, Canada and was established to design and build a series of rifle telescopes specifically for the requirements of Professional Marksmen. We have assembled an extremely experienced rifle telescope development team consisting of optical designers, mechanical designers, engineers and international-class long range marksmen. All have either worked for or consulted to the most prestigious names in the optical sighting systems industry. Our goal is to design, develop and produce rifle telescopes that are beyond reproach in all aspects of design, utility, and service performance. 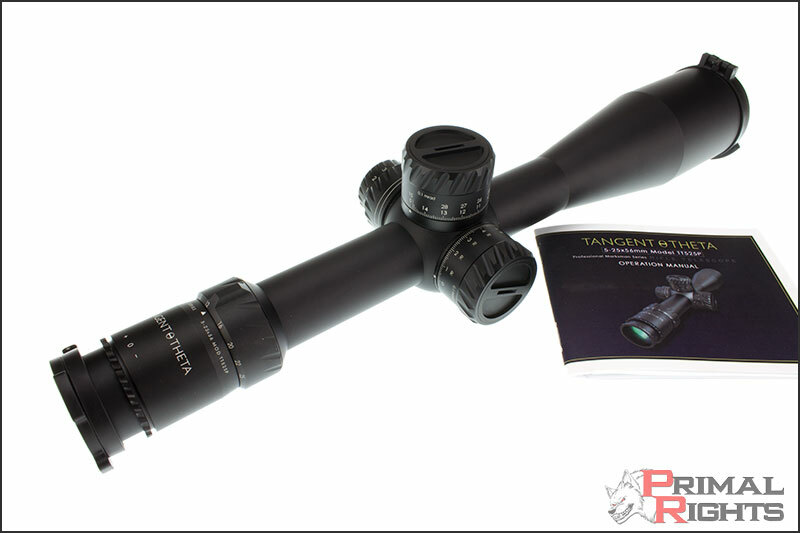 Tangent Theta rifle telescopes are built in our own manufacturing facility in Halifax and are distributed internationally by Armament Technology Incorporated." That is taken directly from the Tangent Theta website. Some bold claims in there to be sure. We recently received the first TT525P available for retail sale in the United States, and we are going to be putting those claims to the test throughout this review. Lets dig in! There can be a lot in a name. In the case of Tangent Theta, there is more to it than many uninitiated folks might realize. Rather than put you to sleep with some heavy math, I'll just point you over here for an explanation. You'll find very quickly that the name carries much more significance than catchy marketing. It's pretty apparent that these folks had their head in the game from day one. I first met Andrew Webber, President of Tangent Theta at SHOT Show 2013, and have subsequently spent countless hours on the phone with him, members of their engineering team, as well as Trevor Publicover, and Ted Milner of Armament Technology, Inc. ATI is the sole international distributor of TT products. The back story on the staff at Tangent Theta would impress anyone, and I do mean anyone. They are some of the most humble, talented, and passionate people I've ever encountered in the firearms community. Check out our SHOT Show 2013 preview for more back story. Some of you may have never heard of Tangent Theta before this review, but I suspect in a few months time, it will be rare to run into someone that hasn't heard of them. 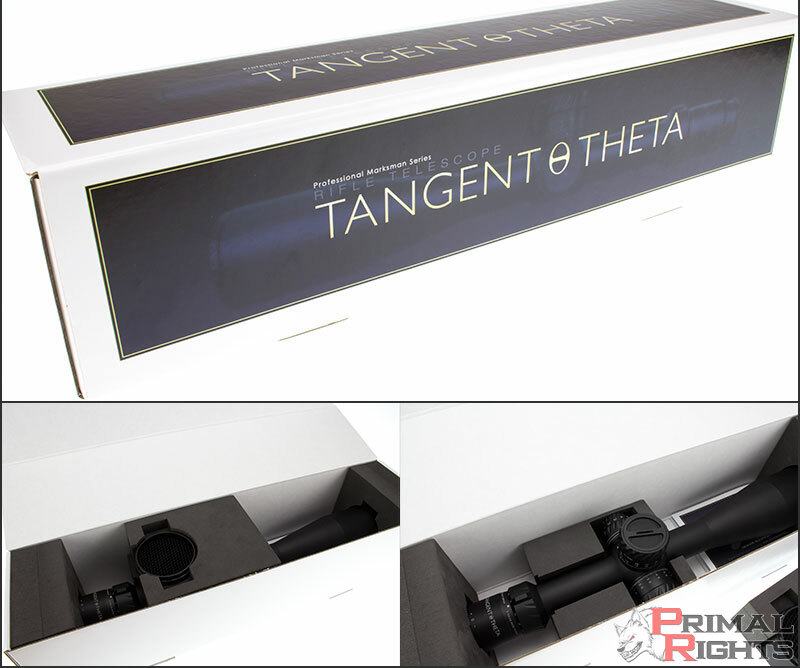 Tangent Theta did a great job when choosing packaging for these scopes. Every box comes shrink wrapped to ensure no one can tamper with the contents when it is in route to you, at least not without you noticing. Inside, they used custom-cut closed cell foam to encapsulate the scopes ocular and objective ends and the turret housing. This could have been taken a step further by using full length foam on top and bottom to guard against punctures, but I'd consider that type of thing fairly rare on a box of this size. Inside each box you'll find a Tenebraex ARD, operation manual, and laminated reticle subtension chart to accompany your scope. The reticle chart is a nice touch. The fact that it is laminated means you can take it afield with you either in your pack or in your databook. Clearly TT has given consideration to the serious shooters among us. 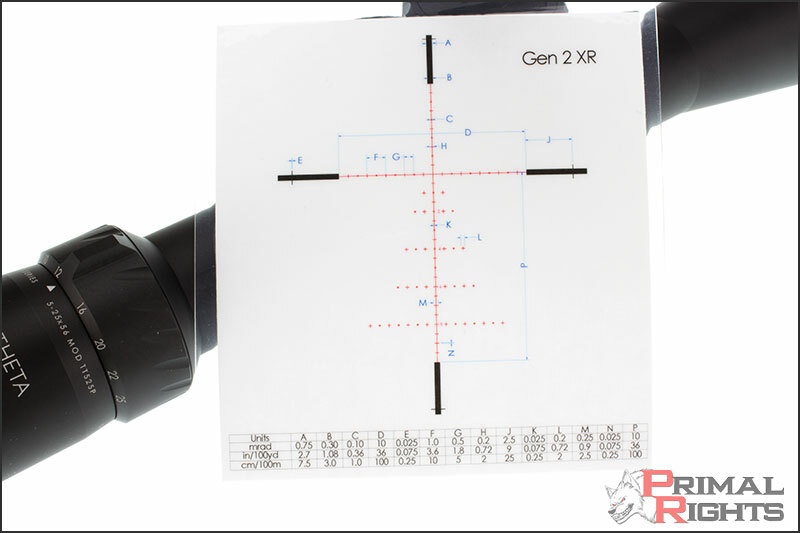 With every scope I've ever owned in the past, I've had to track down a reticle subtension chart on the internet... if one even existed. Bravo gents! Great looking scope by all accounts. All markings are very precisely laser etched and the finish is very uniform and clean. 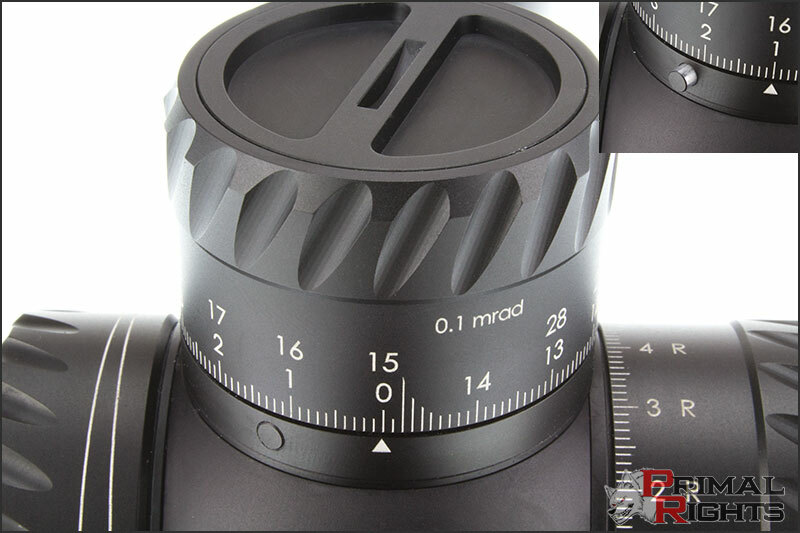 The scopes are Type II anodized, which is not a hard anodizing. I expect this was chosen over the more rugged Type III hard anodizing to ensure a clean environment inside the scope tube. Other manufacturers that I'm aware of which use hard anodizing are plagued with particles showing up on the reticle lens inside the scope. 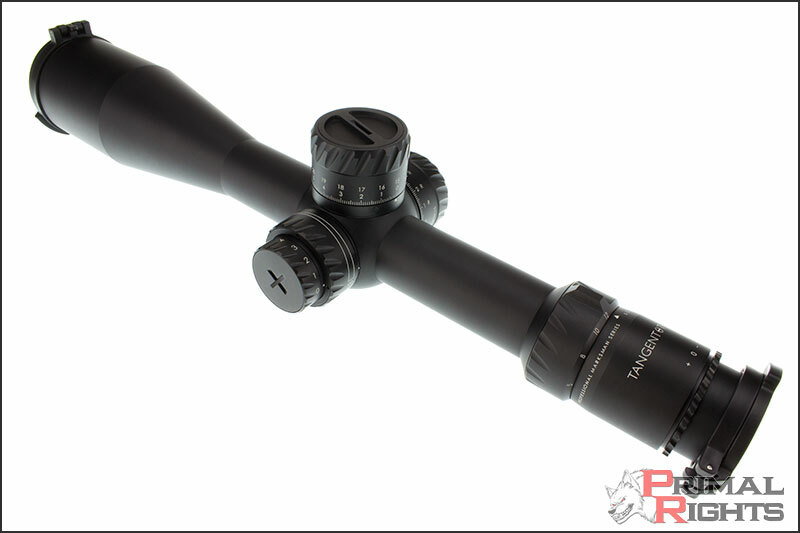 The majority of high end scopes are also Type II anodized, or have a more inferior coating. As a result, these scopes are certainly going to show wear if you get to banging them around, though no more than most any other scope we'd be running. Starting on the ocular end of the scope, you'll notice an upgraded Tenebraex lens cover. The older models of Tenebraex caps had a fair amount of open space around their circumference which let a fair amount of debris and water to get to the lens. These new covers are much better. They have a more positive function and completely seal off the ocular lens to keep out foreign material. It still retains the feature where it folds forward and locks. Those of us that wear hats will appreciate that. In front of the Tenebraex cover is the diopter lock ring. The locking diopter is a very excellent feature on these scopes. Most newer scopes tend to have a European-style quick-adjust diopter. This is a trend that I really don't like to see continuing. The only job of the diopter setting is to focus the reticle. Once that is done, the only reason you'd need to change it is if someone else was shooting your rifle. Once mine are set, they are never changed again as long as I own the scope. The need for a "quick" adjustment on your diopter is only important when you've accidentally moved it to where it shouldn't be... which consequently only happens on the scopes with quick adjust diopters. If that isn't a solution in search of a problem, I don't know what is. Nothing like that to worry about on the Tangent Theta P-series. You loosen the lock ring, adjust the diopter by rotating the rear of the ocular assembly, and then tighten the lock ring and your diopter setting is prohibited from moving. 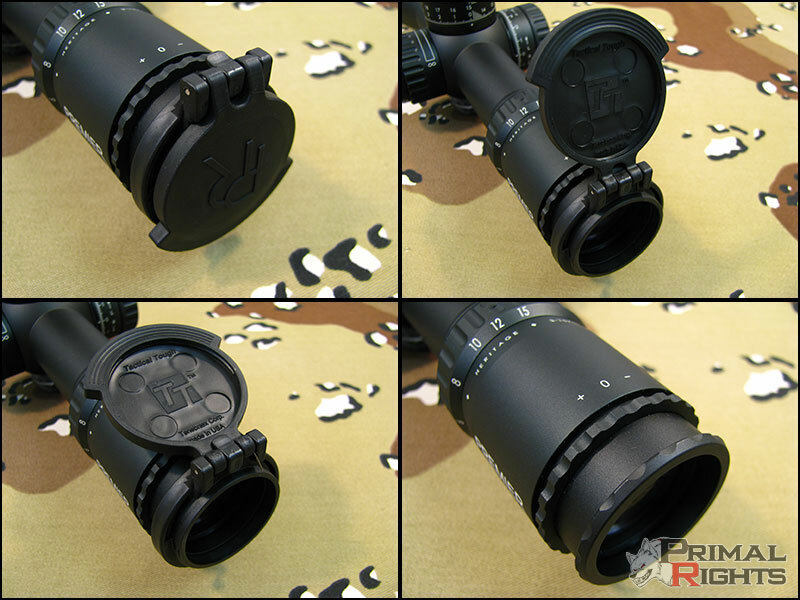 Moving forward from the diopter lock ring, you'll find the identifying markings for the scope. Brand, line, magnification range, and model will be listed just behind the magnification ring. The magnification ring itself is done very well. It is tight enough to ensure you won't accidentally change magnification, but loose enough that it doesn't take a ton of effort to move it. Its contour should lend itself well to a switchview fast-adjust lever should the need arise. The TT525P has a full 5X magnification ratio with no tunneling. You get increased FOV all the way down to 5x. The turret housing. This is the area where every rifle scope earns its money, the centerpiece of which, is the elevation turret. 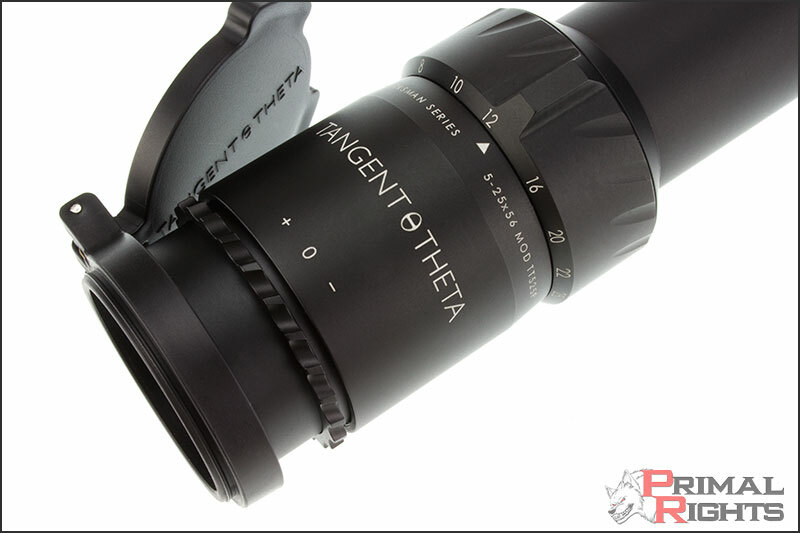 Tangent Theta is designed as a scope for "professional marksmen," as the name denotes. Every aspect of these turrets was clearly aimed at that goal. The 0.1 mil clicks are very precise with just the right amount of tactile and audible feedback. The scopes are offered with or without a heavy click feature, which gives you a noticeably different click on every full mil. I prefer to have the heavy clicks in my scopes, as it allows input of a firing solution without needing to look at your turrets. I'm a huge proponent of keeping your focus on the target, so this is a big plus for me. It is also very useful when dialing the turrets on a clock, while in a stressful situation, or when using night vision equipment. Pretty tough to see the turrets in the dark! 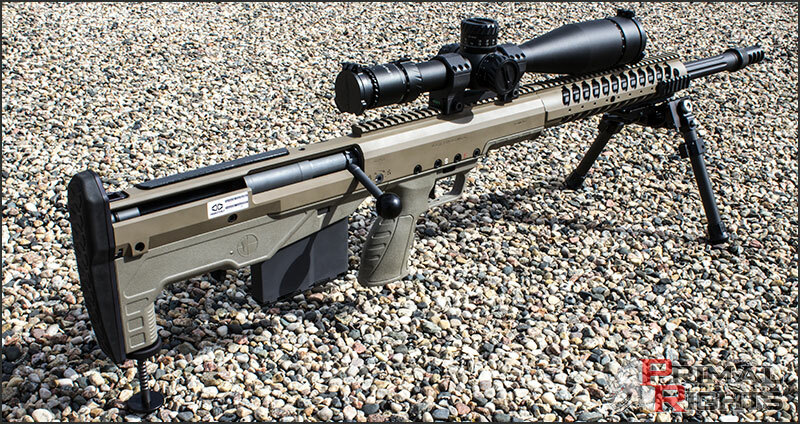 The zero stop functionality is a complete home-run in scope turret design. The top center cap is loosened with your fingers a total of 3 turns, the turret is re-zeroed, and then the top center cap is re-tightened. That's it. Done. It takes seconds to do, requires no tools, and is done without removing the turret cap, and is almost impossible to do improperly. There's even a coin slot in the top cap which will help loosen it up in the event someone goes Mongo when setting the zero stop. Without a doubt this is the most unique, functional, and intuitive turret zeroing and zero stop adjustment of any scope currently offered. As a Desert Tech shooter, I'm switching barrels frequently... so this feature is sent from heaven on the wings of angels! Every shooter, with any rifle, will benefit greatly from it, but those of us with switch-barrel rifles will be especially grateful to have it. The turret is rather large in size compared to most scopes, and this can be a blessing or a curse. From one aspect, its large size and serrated leading edge provides a very outstanding experience when manipulating the turrets, but that large size also makes them a big bulky and prone to getting caught on pack straps or other things. When slung, they have a habit of digging into you in all the wrong places. Personally I'm willing to sacrifice the negatives that impact me when I'm not actually operating the scope, to enjoy the benefits of the positives when I'm engaging a target. These scopes are bulky, but I've not used but a couple scopes in this magnification range that weren't... and none of them were as good as this is! As apparent in the picture, the indicator on the turret housing lines up with the hash marks on the turret cap pretty well. On this particular scope, it is off ever so slightly, but you need to be looking very close to see that, and it is not to a degree which would cause any issue when dialing in a firing solution. The relationship of that indicator to the turret markings did not change throughout the two revolutions of the turret. In the upper right hand corner of the image above, you can see the second turn indicator which pops out on the lower left side of the elevation turret. This is a very handy feature which proves its usefulness during the day and at night. When in daylight, you can visibly see the indicator quite easily, and at night you can feel it protruding from the turret. The windage turret shares many of the same features as the elevation turret. The zeroing mechanism is exactly the same, and the turret has a windage stop functionality giving you 6 mils of adjustment left and right, for a total of 12 mils available on the turret from the zero position. Not getting lost in the turrets, meaning never being unsure of where your turrets are adjusted, is one of the most important aspects of a rifle scope in my opinion. 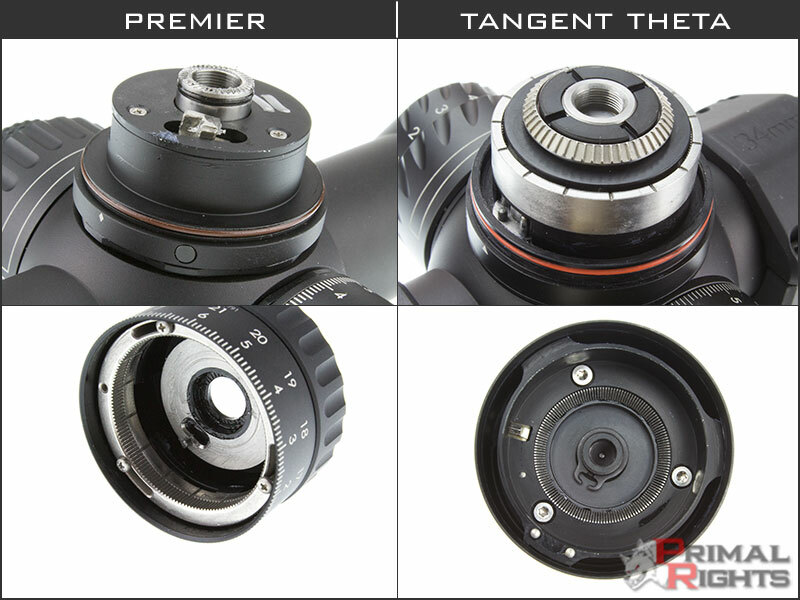 The Tangent Theta P-series certainly has all the features to ensure that will not be a problem. There still seems to be plenty of people on various forums trying to suggest that Tangent Theta scopes are simply a "new" or "re-branded" Premier scopes. This, despite every fact to the contrary that has been provided to date. Clearly, those people have let poor experiences with the products and management of Premier cloud their judgement which has caused them to be incapable of realizing what is actually going on. However, there are those among our viewer base that are legitimately concerned and would like to know the truth of this, and have unequivocal proof one way or the other. Take a look at the images above of the elevation turret from a Premier Heritage as compared to the TT525P. Clearly they are not even remotely the same. There are many aesthetic design features of the TT scopes which are similar to that of the Premier scopes, but that doesn't go past the surface. 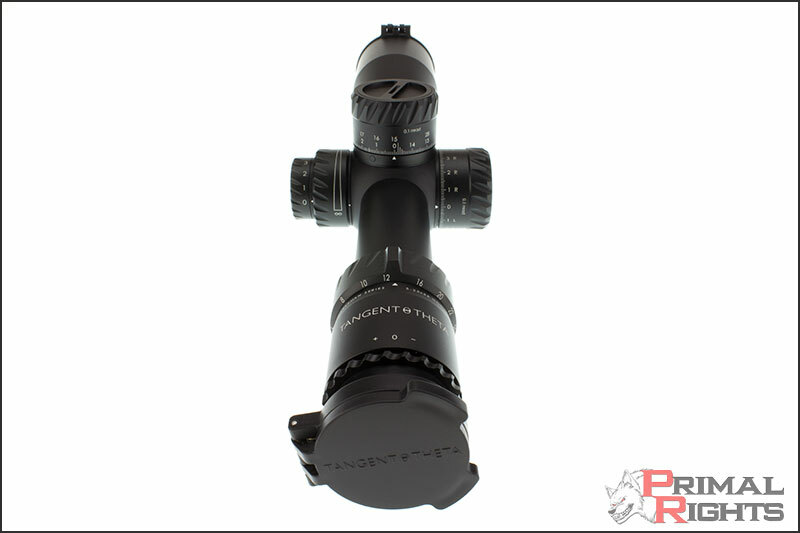 Under the hood, TT scopes are definitively and significantly different from Premier scopes. Tangent Theta as a company are also quite different from Premier. Only a lunatic would dispute that at this point. There are many other design features of the TT scopes which are superior to the Premier designs as well, and in my opinion, superior to most or all rifle scopes currently offered! What about tracking? I performed both a live-fire and measured tracking test at 50yds. I ran the scope through the entire 28 mil elevation turret, stopping at every 10 mils on the way up, and ran left and right 6 mils, then ran the scope back down to zero before continuing up. The scope tracked perfectly, and returned to zero perfectly each time. The measured tracking test showed it moving correctly on the grid, and the rounds fired landed exactly where I expected them to. The resolution of accuracy on a test like this is only as good as the conditions will allow, but the scope performed to a degree that was better than I could effectively measure. I'm told that Tangent Theta track tests each of the scopes before they leave the facility. They do it on an optical collimator of sorts that costs in excess of $100,000. I'm pretty confident that a machine like that can test to a higher degree of accuracy than I'm capable of. That being the case, there is only ONE way to know if your rifle scope holds zero, tracks, and returns to zero properly, and that is to test it for yourself! This particular TT525P performs flawlessly. Given what I know about Andy Webber and his team, I would expect to see nothing less from every other scope that comes from the Tangent Theta facility. They are totally uncompromising men when it comes to the quality of their products. On the left side of the turret housing you'll find the illumination control and parallax control. The illumination is an 11 position rheostat which is easily accessible and viewable from the firing position. The rheostat is numbered from 0 (off) to 11 (max) and has an off position in between each number. So if you want to leave it off between position 8 and 9, you can. The illumination lights up the reticles main stadia, and while the entire x-mas tree isn't lit, a couple holds are lit along with the entire main section of the reticle. Click here for a picture of the illumination, with the understanding that it looks WAY worse in that picture than it actually is. The illumination is not daylight visible, but I'm not too sure why you'd want it to be either. It is night vision compatible however, so you can use it with your favorite clip-on. The cap on the left side of the image above can be unscrewed with a coin or a tool of your choice. The unit is powered by a CR2032 3v lithium battery which can be found virtually anywhere. I'd say the illumination on the TT525P has been very well done. The parallax control encompasses the illumination control and was one of the most surprisingly excellent aspects of the TT525P. 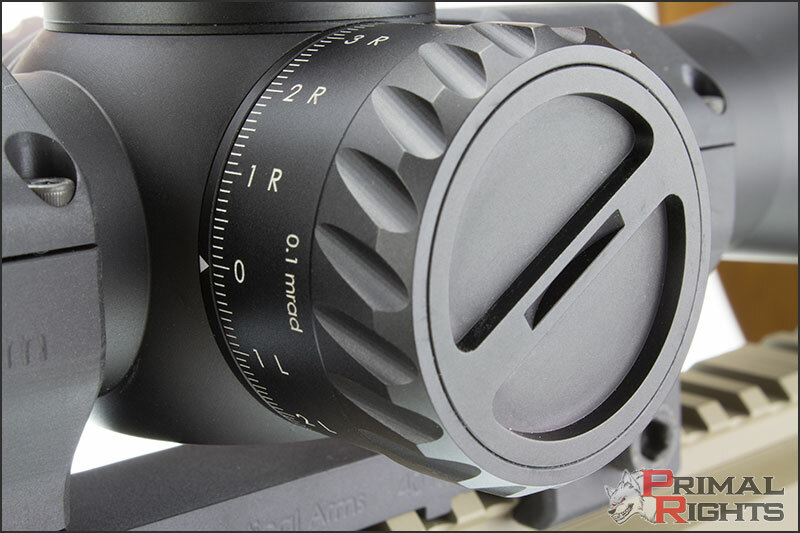 Parallax controls receive a stunning lack of attention when it comes to choosing a scope. I have found certain models of optic to be extremely bothersome to remove parallax error, while others were quite easy. You can have an image in focus, but with parallax error. You can have an image out of focus, but are free of parallax error. On some brands and models of scope, the tiniest movement of the parallax knob will produce error, while other scopes must have their knob turned quite a distance to introduce error. Some scopes can be parallax free at a certain distance, but if you transition to another target just slightly closer, you'll have error again. 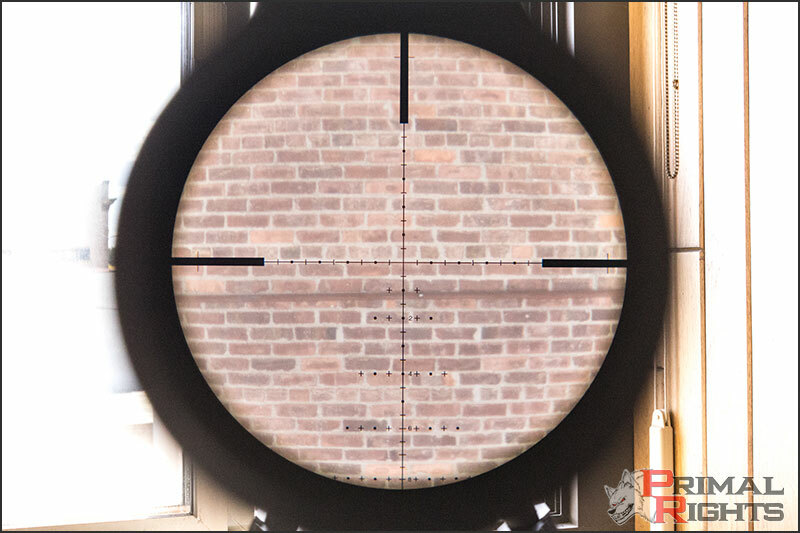 I call this how "forgiving" the parallax is, and it can make a huge impact on how user-friendly and how fast your scope can be deployed effectively against a target. The TT525P has the most forgiving parallax control that I have ever experience in my lifetime. 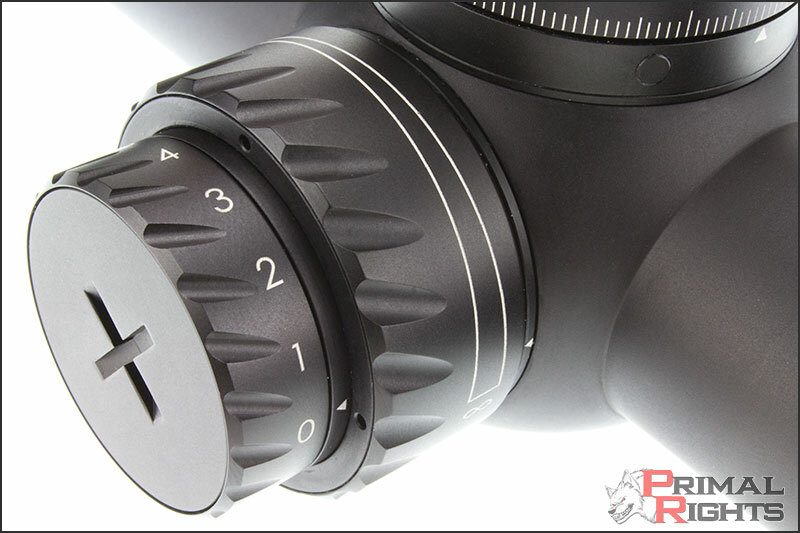 The entire adjustment range is accessed in half a revolution of the parallax knob. The scope reaches max parallax at around 240yds, and is parallax free from there to infinity. This is a very real benefit. Think of being in a competition, and having to transition from one target to the next. Targets at 500yds, or 1000yds, or 250yds can all be engaged without ever having to touch your parallax knob. Let that soak in. I was so blown away by the parallax performance of this scope, I had to break out a couple other scopes to compare it against. I grabbed a Premier 5-25 and a S&B 5-25. I knew the TT was better... but I wanted to know just how much better. I had a human test subject volunteer to walk out in the field with a 2-way so I could bounce my Vectronix PLRF-05 off them and determine what each scopes parallax capabilities were. I had them walk out to 500yds, and I adjusted each scope to be completely parallax free. Then I had them walk out farther until I noticed parallax error in each scope, and did not touch the parallax knob. I recorded that distance as the "farther error." I had them walk in closer, until I noticed error inside of 500yds, and recorded this as "closer error." All scopes were set to max magnification (25x) for this testing. The more magnification, the worse the effect of parallax error. The TT525P spanked the competition handily. It is clear to me that the optical design of this scope is one of, if not the most impressive design I've ever worked with. The Premier had a parallax range that ran from 40yds to who-knows-where. It could be focused and parallax free at any distance that I could see, but I could not see far enough from my bench to find the limit of its parallax adjustment. It still had focus and parallax error at 2.5 miles. From a 500yd parallax-free setting, the test human was able to get as far as 598yds before over 0.1 mil of parallax error was detected, and as close as 249yds. The Premier parallax wasn't very finicky at all. I could turn the knob to where the target was in focus very easily, and if the target was in focus, it was free of parallax error. The S&B wins the minimum parallax game by almost 20yds, and maxes out its parallax at 500yds. I could turn the parallax dial out past that by quite a bit, but farther targets did not present any significant parallax error... though the targets were out of focus. So while parallax error did not exist past 500yds, I still needed to adjust the knob to bring the target in focus. The target needed to come in to 331yds before I started noticing significant parallax error. Adjusting this scope to remove parallax was by far the worst of these 3, and has been one of the worst I've used historically. This is not based on a sample size of one either, as I've used dozens of S&B 5-25's over the years. It is one of my primary gripes about those scopes. They are extremely finicky, with tiny adjustments introducing error, and not necessarily being able to be sure that error has been removed based on the target being in focus. This is apparent in the extreme inside of 150yds. The Tangent Theta TT525P has a minimum parallax of 30yds, which is oddly closer than their published spec, and reaches max parallax at an astonishing 240yds. That means you have an in-focus target, and no parallax error, from 240yds out to infinity! When the scope was set parallax free for the subject at 500yds, going farther didn't matter and they needed to come in to 226yds before I began to notice parallax error. That is absolutely unbelievable. On top of that incredible behavior, this scope has the easiest to adjust parallax that I've ever used. The knob is not finicky, and once you have a clear target, you're set. It's very easy to find that condition too, so you aren't jockeying the knob back and forth much at all. All of this, while only needing a half turn to go from minimum to maximum! Tangent Theta, I don't know what you people did to accomplish this, but you hit a grand slam here. 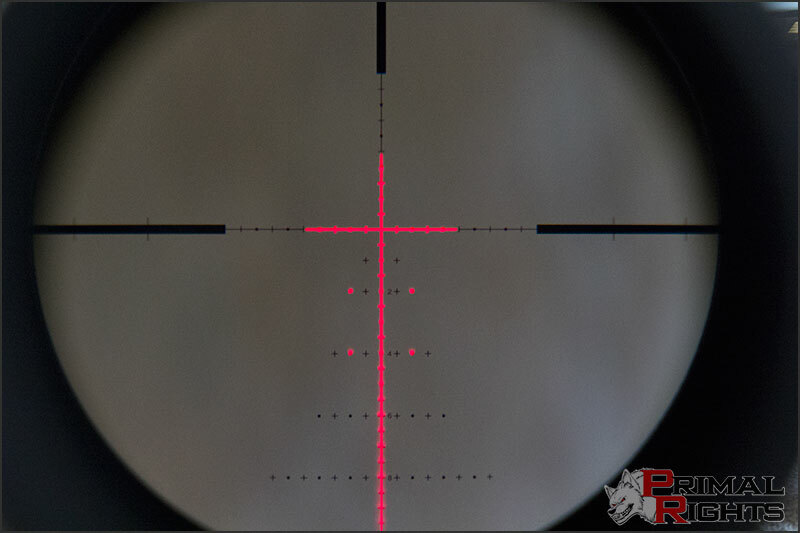 The current reticle choices in the TT525P are the GenIIXR you see pictured above, or an MOA reticle of similar design. There will be more reticles added to this lineup eventually, but I don't expect to see any of those until toward the end of 2015. I'm OK with this, as I absolutely love the GenIIXR. It's the most capable reticle I've used to date, but this is largely user preference. Tangent Theta understands this, and they are considering which reticles to roll out with in the future. The MSR has been the most requested reticle, but they will entertain all options. If you have an opinion on the matter, you can send them a formal request using their contact form on their website. Do not, and I repeat, do not draw any conclusions regarding glass quality from the through-the-scope picture you see above, because there are no conclusions which can be drawn. That picture is meant to illustrate the reticle only. Cameras are not human eyes, and as such, they do not give an accurate representation of what it looks like to view through the scope. Now that we got most of the technical stuff out of the way, I'll talk for a bit about some of the over-all experience when using this scope. Consequently now we're getting to the portion of the review where a lot of things start to get relatively hard to quantify, as there is no fixed datapoint to discuss. Instead you have to rely on my experience with tons of different optics to try and make comparisons with. Luckily I have a ton of experience with a lot of different optics to draw from, but make sure you remain alert when reading these next parts, as some of it is purely user preference while other bits are hardened fact. Some of you have may heard the term "eyebox" being thrown around in relation to rifle scopes before, and some of you may not. Basically, eyebox is a term used to describe how much "wiggle room" your eye has behind the scope before you start to lose full edge-to-edge view through the scope. This translates directly to how easy the scope is to get behind in compromised firing positions. A forgiving eyebox will let you be a bit off axis and still have full view through the scope. The TT525P has a very forgiving eyebox. I had no problem getting in behind it in any reasonable firing position. There is only one scope out there that I'd say has a better eyebox, and that is the Hensoldt 3.5-26. Even still, it would be a marginal victory if a victory at all, and the extra $3000 to own the Hensoldt ($7000 retail) certainly isn't paid for by this. I didn't have a henny available so I couldn't do a side-by-side to confirm this on the spot, and was drawing from past experiences with that scope. I remember being impressed by the eyebox on the henny, and the TT525P is more forgiving than both the Premier and S&B 5-25's. Needless to say, you won't be disappointed with the eyebox on the TT525P. Eye relief is another one of those things that is rarely focused on in reviews, but can be extremely annoying if you have a scope with poor eye relief management. Eye relief, like parallax, eyebox, and tunneling can be tell-tale signatures of how good, or bad, the optical lens design in a scope is. Eye relief is the measurement between your eye and the back of the scopes ocular housing when you are in a position to have full view through the scope. A scope with poor eye relief will show itself in two major ways. The first is that it will have short eye relief, which will help you get punched in the eye socket by magnum recoil. The second is eye relief that changes with the magnification ring. Ever get behind a scope on 5x magnification, turn it up to 25x and find that you need to get closer to the scope to get a full picture? Yeah, that's bad. Some surprisingly expensive rifle scopes exhibit this behavior. The TT525P does not do this at all. This means you can set LOP on your rifle, get in proper firing position, set your eye relief when the scope is on max magnification, and lock it down. From 25x down to 5x, your cheek weld does not need to move one single bit. Tunneling. The TT525P does not do it. This is something that seems to be a deep and dark hidden secret among the optics world, as you will never see it listed in a specifications page. Heck, most reviewers don't even take the time to inform their viewers of it, and a lot of them wouldn't know what it is even if they did. For a description of tunneling, check out this video we did a while back. Some people don't mind tunneling, but I fall into the "absolutely hate it" crowd. I want all of the FOV I paid for, not just some of it. The TT525P does not tunnel. It has a true 5x magnification ratio. That is just another demonstration of how incredible the optical design in this scope is. Another factor to consider when buying a scope is the warranty. Tangent Theta has a "forever" warranty on their products. This means they have a transferable lifetime warranty. If the product has their name on it, or the Premier name, they will warranty that product as long as they are in existence. I would expect the customers of Tangent Theta to not need the warranty department much, but if the need should arise, I have 100% confidence that TT will be there to treat them like royalty. Now on to the most impossible to quantify aspect of any rifle scope; the glass quality. Oh how people love to talk about glass. I've come to the conclusion that people talk the most about things which cannot be proven beyond a reasonable doubt. If it can't be proven, then they can take any position they want, and the other side can't prove them wrong! Well let me break it down for you. When it comes to glass quality, there is but one single question to ask: Can I identify my target? Bottom line is that glass quality has never prohibited me from engaging a target. There was always some other factor that got in the way long before the quality of my glass did. Having said that, of course I'm a fan of the best glass out there. Companies like S&B, Zeiss, and Swarovski have made their entire business on good glass. It can, and often does make a difference, but almost never in whether you can engage the target or not. What it does make a huge difference on is the users "experience." Our brains love input even more than Johnny 5 in that Short Circuit movie. The more pretty colors and detail we can see, the happier we are. This is why HD TV sales are at all time highs! As with all of those things, beauty is in the eye of the beholder. An image will look fantastic to one person, and crap to the other. Our eyes are all programmed a bit differently, which leads to different tastes. It is for this reason that it is absolutely, and unequivocally impossible for people to effectively judge optical quality in rifle scopes. However, rifle scopes are not binoculars or telescopes. They aren't for bird watching or looking at the moon. There are far more imperative considerations to be made. Having said all that, the Tangent Theta TT525P has outstanding glass which I'd put on par with any other top brand which is known for exceptional glass. The "user experience" behind this scope meets or exceeds that of any other rifle scope out there. Obviously there is room for user preference in nearly everything. Some people would rather drive a '72 ford pickup every day than a brand new one too. As I said, this stuff is basically impossible to quantify. However, I'd be shocked if someone said the glass in the TT525P was the limiting factor. In summary, I feel that Tangent Theta will secure their position as the top rifle scope manufacturer in the world in the coming years. Not in size, and not in quantity, but in sheer quality of the scopes and the feature set they provide. If they can replicate the scope I have in my hands infinitely, they will become the new gold standard by which all other rifle scopes are measured. These scopes are truly for Professional Marksmen, and as a result, all of us can benefit from them. Though don't take my word for it; Give us a call and get your Tangent Theta ordered today!